I read a post recently about the beauty of rereading books. I’ve been wanting to reread some old favourites just to experience those lovely feelings all over again. I’ve also recently been quite pensive concerning young adult (or ‘YA’) literature, mainly because I’ll be heading off to university soon, and these aren’t typically the types of books we study. This is definitely a train of thought for another post, but this recent absence of YA in my life made me eager to return to the ‘founding fathers’ (of sorts) of my experience with YA. 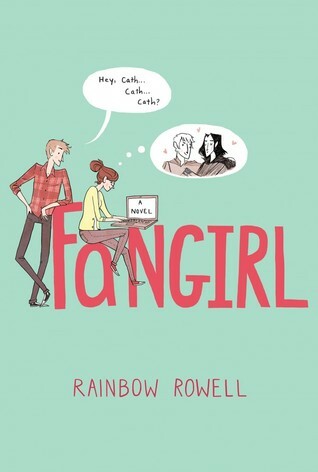 Fangirl was one of the first YA contemporary novels that I ever read, back in June 2014, when I was 13 years old and inevitably entering those existential teen angst stages of life. Cath is a character I related to instantly, even way back then. I felt connected to her on a higher level than I had ever experienced with the protagonist of a novel. She too was young, shy, socially awkward and – most of all – a fangirl, something I tended to keep a secret. But why not confess it here and now? Like Cath, I used to write fanfiction. I had an Instagram fan account for my favourite bands and I made memes about The Hunger Games in my spare time. No shame. Rainbow Rowell – through this startlingly familiar character of Cath – taught me that our passions are not something to be ashamed about. She equally introduced me to a character that had similar anxieties to my own. In short, when reading about Cath, I felt like I was reading about myself – it felt like Rainbow Rowell was specifically letting me know that everything would be OK, it would all turn out OK in the end. Reading Fangirl four years on, I feel more connected to Cath than ever. We are now the same age, after all, and I’m just about to start university just like Cath was at the start of the book. However, unlike Cath, I have this book to teach me beforehand that everything will be OK.
Aside from this reminiscent and – frankly – mushy throwback, I have to mention how enjoyable Fangirl is to read (and to reread). Rainbow Rowell is such a magnificent writer with perhaps the best dialogue, wit and realism I have ever read; I have read most of her books, and I say this each and every time. However, Fangirl (clearly) will always have such a special place in my heart. I would even go as far to say that it is my favourite YA contemporary. Maybe even my favourite contemporary. It definitely means something to be able to read and love this book just as much – if not more – four years after I read it for the first time. Especially when I keep thinking YA is something I’m starting to ‘outgrow’! This time, I pretty much read Fangirl in a day. I just couldn’t drag my mind from Lincoln, Nebraska, where the book is set. I had to sideline some responsibilities to get my fill of Cath and Levi. And, even after three reads, their love story still makes my heart melt. I’m definitely a fangirl for these characters – a fangirl for Fangirl – and revisiting them was akin to revisiting old friends. Isn’t that the beauty of books? The beauty of rereading? These characters define certain periods in our lives – not only do we revisit them, but past versions of ourselves, too. This was certainly the case when rereading Fangirl four years on. I would highly recommend not only this book, but rereading this book. And then rereading it again.